Have I mentioned that I cycle the entire region covered by this blog? About ten-thousand miles per year on these roads familiarizes me with many places that cater to cyclists. In general, these are places where you can get a cup of coffee, some carbs and protein. Bacon, egg and cheese sandwich anyone? Or maybe a great cookie or muffin. Add a place to sit and an owner who doesn’t yell when you walk on her floor with cycling cleats plus a restroom and you’re good to go! This list is sorted by places from south (Yardley, PA) to North (Milford, NJ) and beyond. What are your favorite places to go while out on a ride? Wawa – the old stand-by. This Wawa has a bathroom but lacks a bike rack and seating. You’ve all been there, so there’s no need for further verbiage. C’est la Vie French bakery, New Hope – Popular riverside spot with outdoor seating. Hidden down a narrow lane. Several people have recommended their tarts. Restroom. oWowcow Creamery, Lambertville – With prodigious servings in many innovative and delicious flavors, oWowcow ice cream is a favorite stopping place after riding a century. Pure Energy Cycling and Java House, Lambertville – A great supporter of local cycling. How many bike shops have a coffee bar? Rojo’s Rostery, Lambertville – With easy cyclist access at the North end of town, and just down the street from the famed OWowCow, Rojo’s has achieved a strong following of coffee fanatics. Starbucks, New Hope – right on the corner of Bridge and Main. You can almost always find a cyclist there. Restrooms. Wawa, New Hope – this is one of the small Wawas. No bathroom. Dilly’s Corner, Center Bridge – The most popular ice cream and burger joint in the area. Surprisingly good food and generous servings of ice cream. Bathroom is hidden on the river side of the building. Stockton Market – A great selection of made-to-order dishes from a variety of vendors. Coffee, crepes, bread, chocolates, BBQ, pizza, ice cream – something for almost everyone and at a quality level you won’t find in a mini-mart. There’s a restroom hidden somewhere but I’ve yet to find it. Max Hansen Grocery / Carversville Store – Max Hansen has some of the best baked goods around. Their gourmet Devil Dog is worth the calories! Great breakfast sandwiches and deli items. There’s a bike hanger on the left side of the store. Clean bathroom in the back to the left of the deli. Sergeantsville General Store – A favorite of cyclists for years. Restroom in the back to the right. Nina’s Waffles – Newly opened in Sergeantsville. What better way to take a rest stop than with some amazing waffles and ice cream? If they have their almost croissants, be sure to grab one – they’re among the best I’ve had. No restroom. Carousel Deli & Bakery – No public restroom. Has the basic food for cyclists – coffee, baked goods, deli. Not the friendliest place but it’s a popular stopping point for cyclists. Boro Bean – Coffee. Ice cream. Baked goods and a bathroom. Little porch out front is a good place for sweaty cyclists to relax. Quick Chek – Similar to Wawa. This chain of gas stations/convenience stores offers coffee, sweets, sandwiches and clean bathrooms. There’s a second location at the intersection of rt. 31 and 579. Tabora Farm and Orchard – Located north of Peace Valley Park, Tabora has become a haven for cyclists. Farm grown fruit, baked goods, coffee, sandwiches and even crepes are available along with ample outdoor seating and restrooms. Beware of the cookie table located by the cash registers – it’s almost impossible to resist grabbing one (or a few)! The Market at DelVal College – a wonderful market, stocked with local produce, baked goods and everything else a cyclist could need. Gourmet deli prepares great sandwiches. Bathroom tucked away at the left end of the store. Gardenville General Store – At the intersection of 413 and Point Pleasant Pike. A great little deli with killer breakfast sandwiches and muffins. Don’t think they have a public restroom. The Corner Store – At the crossroads of 519 and rt. 12, the Corner Store has some satisfying grab-and-go sandwiches as well as most of the stuff you’ll find at other convenience stores. Ginny’s Cafe – Up rt. 12 a half mile from the intersection of 519. Outdoor picnic tables and window for ordering make this a convenient stop for cyclists needing some quick calories. If you’re really hungry, they’ll let you order off the main menu from the window but the place is popular that the wait can be long. Restroom inside the restaurant. Factory Fuel Co. – Coffee house. Some of the best coffee around. Friendly service. Decadent salted caramel brownie and homemade doughnuts. Restroom. Bobolink Dairy and Bakehouse – a non-traditional cycling stop. But if you want a hunk of bread and great cheese made on-site, this is your place. Restroom on the left side of the building. Frenchtown General Store – Gritty hole in the wall that satisfies the needs of cyclists – drinks and baked goods. Restroom? Galasso’s Pizzeria – some of the best pizza around. Eggplant and Arugula pies are killer. Restroom down a corridor to the right of the cashier. Lovin’ Oven – cyclist friendly place to stop for a more substantial meal. Nice outdoor patio and big bike rack. Restrooms. 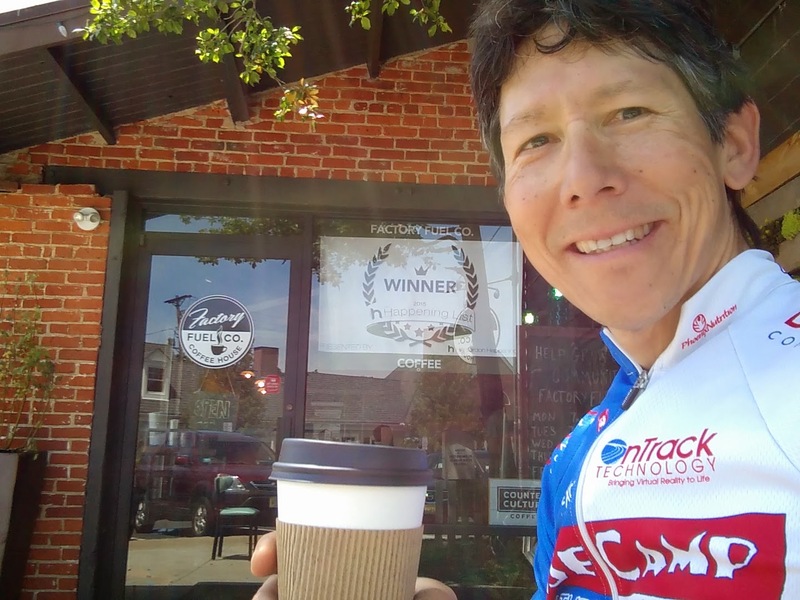 What’s Brewing at Maria’s – cyclists love Maria’s and Maria loves them back. Good selection of coffee and baked goods. Must try her apple cake – the best around. Restroom at the back. Homestead Coffee Roasters – When you need a “Dead Man’s Brew”, you know where to go. Deli counter makes sandwiches. Usually has soup. A great place to stop and admire the wildlife along the canal. Bathrooms in back beyond the coffee beans. Dutch Mill Market – makes one of the best club sandwiches around. For a non-descript little store, I’ve been pleasantly surprised by the quality of their food. Great coffee cakes with enough calories to power a century ride. No public restroom. Milford Station Bakery – Right next to the bridge. One of the most popular stops around. Cyclists from many places converge on Milford Station every weekend. Clean restrooms at the back (take a left if you enter from the big deck entrance). Jimmy’s Ice Cream – soft and hard ice cream as well as a variety of sandwiches and burgers. Generous servings. Bathrooms on the left side of the building. Trauger’s farm market – a farmer’s market on a stretch of road where you won’t find much else. I think there’s a port-o-john on the farm but never used one. RIP Applejacks – where us Rule #9 & #5’s stopped for a shot and a beer.